"Joinng the merry and eclectic mix of food and drink operations along the Broughton Street strip, Pickles is part wine bar, part evening café, part victualer. Located in the basement space below L’Escargot Bleu, Pickles retains the air of a connoisseurs corner by serving up cheese and meat platters along with a glass of wine, bottle of beer or a cup of tea or coffee. Later opening hours (it’s a late afternoon to late evening place) and the hideaway feel of the basement give it a clubbish feel, while blackboards, bar stools, leather sofas and walls lined with jars of pickles, preserves and chutneys emphasise the sense that this is a place that’s slightly off-beat but also unintimidating and friendly. If it had been around for decades it would be an institution." This "perfectly sympathetic wine bar is a local secret though nevertheless much commended on TripAdvisor. Selected wines, charcuterie platters (conveniently available late if you can get a table). Feels like a comfy bohemian parlour or salon. 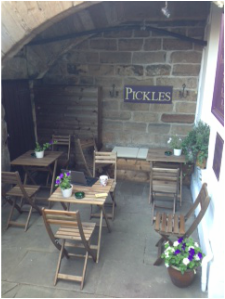 A few outside tables under the stairs. My local hang-out so I have an interest in keeping it quiet. Do not come here!" Peter Irvine - nominated in his "high fives - best Edinburgh Pubs". For more reviews on Trip Advisor click here.